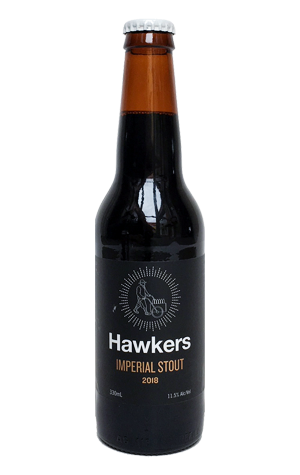 Hawkers has a number of barrel aged imperial stouts set to leave the brewery some time during winter 2018 but has sent out a teaser first in the shape of its third imperial stout. Once again, they've looked to beef it up from previous years, rising from the 10 percenter of 2016 via the 10.7 percent ABV 2017 vintage to this year's 11.5. In bolstering the booze last year, some of the refinement of 2016's debut was lost; here, the balance has been redressed. The beer delivers its array of dark chocolate, roasted malts and espresso characters in a broader, bolshier manner than in 2016 but keeps the alcohol wrapped up in a warming, malty embrace rather than letting it escape as with last year's release. You can read more about Hawkers' winter of big beers in this interview with head brewer Justin Corbitt.